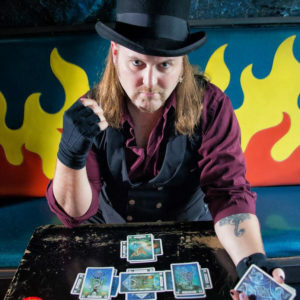 Austin Ghost Tours has been researching and investigating Austin’s haunted history for over 25 years. Our goal is to provide both a superior customer experience as well as educate and inform the actual truth about ghosts. Jeanine Plumer and the tour guides are all published authors on Austin history. Our stories are original, backed by research, and are often based on personal experience and first-hand accounts. We are passionate about exceeding your expectations. We love our customers and welcome your feedback and suggestions. Use our Contact Us page to tell us what we’re doing right, what services or experiences you would like to see us offer, or how we may improve. 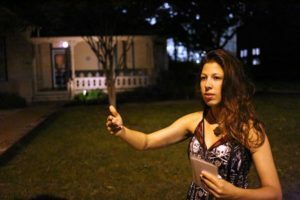 Initially, when I decided to start a walking tour company in Austin, my intention was to give tours about Austin’s unique history – historic downtown walking tours. While researching the old buildings downtown, the building occupants would mention with surprising frequency unexplained events taking place that they attributed to a … ghost. I would nod my head and pretend to listen, but really, I had never thought about ghosts in my life. Still, every now and then on a tour, I would mention that the building dwellers believed they had a ghost. When I mentioned that, the people in the tour group invariably lit up with interest. It became obvious: they wanted to hear ghost stories! It was then I decided to collect Austin’s ghost stories and create a ghost tour. Of course the first question to ask is who is haunting the building? It came to my attention that pretty much everybody believed their ghosts came into existence through some sort of drama. Each suicide or murder seemed to be over lost love. Every building was at one point either a brothel or bordello, a speakeasy or gambling hall. Austin’s colorful famed gun fighter Ben Thompson was haunting every bar in the city. What ended up floating around with the ghosts were lots of urban legends, no real facts. I decided that if I was going to tell these stories, I was going to tell the real story. After all, we don’t REALLY know what is happening, but perhaps by telling the truth I would stay on the good side of the spirits. What I discovered, of course, changed my life. Whatever you want to call these energies – ghosts, spirits, or souls – they seem to be remnants of people who have lived, died and continue to reside. Why they choose not to leave, or whether they’re unable to, we don’t know. What you believe is your choice, but I can tell you without a doubt, there is something happening around us everywhere, barely discernible, but very much there. After interviewing thousands of people, it is clear what ghosts can do is astonishing. They can turn lights on and off along with televisions, cell phones, fire alarms, and water faucets. They can open and close doors, windows, and shades. They can move objects of all sizes, make phone calls, move furniture, knock on doors, ring doorbells and even talk to you. These occurrences are just some of the phenomena taking place in Austin’s buildings populated by the living and other-worldly beings. Point to ponder: a majority of people who have an experience that they believe to be a ghost do NOT feel fear. When researching who these people might have been in life, I soon discovered that the residual energies that remained were not famous Austinites, the infamous, or those who were “bigger-than-life” in any way. The spirits that remain are regular people like you and me. It is the woman who was widowed at a young age and opened a millinery shop on 6th Street to support herself and her children. Every morning for much of her life she sent her kids to school and went downstairs to open her business. Some part of her spirit is still doing that. It is the man who began working as a porter at The Driskill Hotel at age 16, the fourth generation in his family to do so, tending to guests into old age – and beyond. It is the woman who entered the Confederate Women’s Home when she was 65 years old and died there at the age of 90. Every day for 25 years she walked the hallways – and still does today. My concluding belief is that most ghosts remain because of life. The life they lived makes a stronger imprint than the process of their death. John of House Maverick, First of His Mane, the Untrimmed, King of the Vandals and the First Magicians, Khal of the Great Ghost Tour, Wielder of Chains, and Maker of Monsters. Alexandra is a full-time professional tour guide, taking folks through cities all across America and Canada. In her spare time, she dabbles in Shakespeare, writing, swing dancing, and admiring Austin’s street art. She’s spooked by ghosts, but like any of her fears, such as heights, she meets them head on, whether that be parachuting out of a plane or conversing with the spirits of the dearly departed. As a wise woman once said, nothing in life is to be feared; only understood. Stephanie is a museum professional and an archeologist and seventh generation German Texan from La Grange, Texas. Growing up in a historic and haunted house, she is familiar with ghosts. While she has always had the curiosity to learn more about hauntings, she never really got the chance to do so. Her strong interest in Texas history and archeology lead her to end up with a masters degree in Museum Science. She worked as a field archeologist for various cultural resource management (CRM) firms and as a collections assistant at museums and an archeological research laboratory in Texas. After several years of working as a seasonal field archeologist, she decided to return to museum related work. 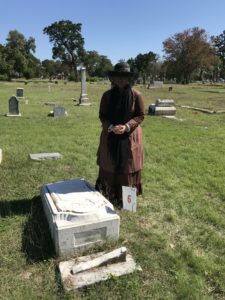 This lead her to landing a position as a gallery assistant/docent at the Texas Capitol Visitors Center where she conducts tours at the visitors center, the Texas State Cemetery, the Governors Mansion, and occasionally the Texas State Capitol. One day, one of her co-workers at the visitors center (and long time AGT tour guide Elizabeth) announced that Austin Ghost Tours was looking to fill a spot for a new tour they were starting in SW Austin at Arbor Trails. The chance to learn more about the paranormal had finally come. Upon signing up as a convict character for the tour, it didn’t take long until she experienced a haunting. Since then, she has been actively researching stories and learning how field investigations are conducted. In her spare time, she is a DJ and writer for an online radio station RenegadeRadio.net. Corissa Chopelas has a passion for ghosts, witches, vampires, folklore and all things magical and mysterious. In 2012, she graduated from St. Edward’s University with a Bachelor’s Degree in World Religion, multiple public speaking awards, and a goal of becoming a teacher. Since then Corissa has trained as an energy worker and now has a private practice as a healer. While in school Corissa was looking for extra work as a tour guide. When she discovered Austin Ghost Tours in 2011 she knew this was the only tour guide job for her. 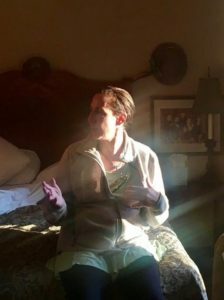 Since there were no openings at the time of her initial application she was persistent throughout the next year until an opening became available. 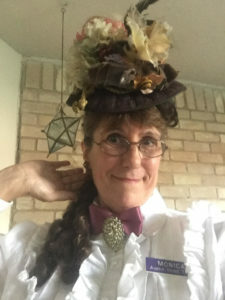 Corissa now uses her passions for teaching, public speaking, and the magical and mysterious to regale tour guests with tales of the ghosts of Austin. During the day Corissa works to heal the souls of the living and by night she works with the souls of the dead.